Everyone is familiar with the brilliant colours exhibited by a thin oil film spread on the surface of water and also by a soap bubble. These colours are due to interference between light waves reflected from the top and the bottom surfaces of thin films. When white light is incident on a thin film, the film appears coloured and the colour depends upon the thickness of the film and also the angle of incidence of the light. 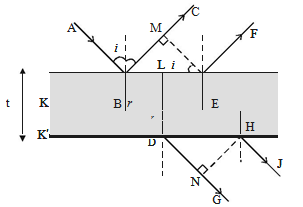 Consider a transparent thin film of uniform thickness t and its refractive index µ bounded by two plane surfaces K and K′ as shown in figure. A ray of monochromatic light AB incident on the surface K of the film is partly reflected along BC and partly refracted into the film along BD. At the point D on the surface K′, the ray of light is partly reflected along DE and partly transmitted out of the film along DG. The reflected light then emerges into air along EF which is parallel to BC. The ray EH after refraction at H, finally emerges along HJ. BC and EF are reflected rays parallel to each other and DG and HJ are transmitted rays parallel to each other. Rays BC and EF interfere and similarly the rays DG and HJ interfere. A ray of light travelling in air and getting reflected at the surface of a denser medium, undergoes an automatic phase change of π (or) an additional path difference of λ/2. Since the reflection at B is at the surface of a denser medium, there is an additional path difference λ/2 . where n = 0, 1, 2, 3 … and the film appears dark. If light is incident normally i = 0 and hence r = 0. Therefore the condition for bright fringe is 2µt = (2n–1)λ/2 and for dark fringe is 2µt = nλ. Hence, condition for brightness is 2 µt cos r = nλ and condition for darkness is 2µt cos r = (2n – 1) λ/2. The optical properties of thin films arise from interference and reflection. The basic conditions for interference depend upon whether the reflections involve 180 degree phase changes. Thin film interference provides another line of evidence for the wave behavior of light. There are two waves that emerge from the thin film - one wave that is reflected off the top of the film (wave 1 in the diagram) and the other wave that reflects off the bottom of the film (wave 2 in the diagram). In, thin film interference refracted rays remain in-phase with their initial rays. If both reflections occur at interfaces of less/more, then both are inverted and their net phase difference is zero. If both reflections occur at interfaces of more/less, then neither is inverted and the net phase difference between them is zero. However, if one reflection occurs at less/more and the other at more/less, then there is a net phase difference between the reflections of ½ λ. Thin films between two media often produce iridescence and other interference patterns: areas of destructive and constructive interference for different wavelengths. One slit of a double slit experiment is covered by a thin glass plate of refractive index 1.4, and the other by a thin glass plate of refractive index 1.4, and the other by a thin glass plate of the refractive index 1.7. The point on the screen where the central maximum fal before the glass plate was inserted, is now occupied by what had been the fifth bright fringe was seen before. Assume the plate have the same thickness t and wavelength of light 480 nm. Then find the value of t in  µm. Five fringes have be shifted. From the above observation, we conclude that, the value of t will be [5λ / (µ1 – µ2)]. colour does the soap film appear at normal incidence? These are the only wavelengths close to the visible region of the electromagnetic spectrum for which destructive interference occurs. In fact, 680 nm lies right in the middle of the red region of the spectrum, whilst 340 nm lies in the ultraviolet region (and is, therefore, invisible to the human eye). It follows that the only non-reflected colour is red. A wavelength of 272 nm lies in the ultraviolet region whereas 1360 nm lies in the infrared. Clearly, both wavelengths correspond to light which is invisible to the human eye. The only strong reflection occurs at 453 nm, which corresponds to the blue-violet region of the spectrum. The reflected light is weak in the red region of the spectrum and strong in the blue-violet region. The soap film will, therefore, possess a pronounced blue colour. (d) both produce waves having the same velocity. To get answer to any question related to interference by thin film click here.